Ancient India, one of the world’s earliest urban civilisation has crossed several centuries. It had a long-lived civilisation. Many shreds of evidence have been found that culture of Ancient India has similarities with Sumerian, Mexican, and Mayan culture. Evidence has been found that there was a social interaction between the Indus valley and Sumeria. Indian teak was found in the ruins of Ur(Mugheir), which was the capital of the Sumerian kings in the IV millennium B.B. and the other is that the word Sindhu or muslin is mentioned in an ancient Babylonian list of clothing. The occurrence of ‘s’ in the word proves that this muslin did not go to Mesopotamia via Persia, for then ‘s’ would have become ‘h’ in Persian months, as the name of this country, derived from the river Sind. Therefore, muslin went directly by sea from the Tamil Coast to the Persian Coast and the Babylonian word Sindhu is not derived from the name of the river but from the old Dravidian word, ‘sindi’, which is still found in Tulu and Canarese, and means ‘a piece of cloth’ and represented by the Tamil word ”sindu”, a flag. Harappa was known as Meluha to the Akkadians. Like the evolution of state-building in Mesopotamia, its focus was land- based, but it also engaged in significant sea-going trade with Gulf. The Sargon I text refers to Meluhha boats as being large cargo vessels. 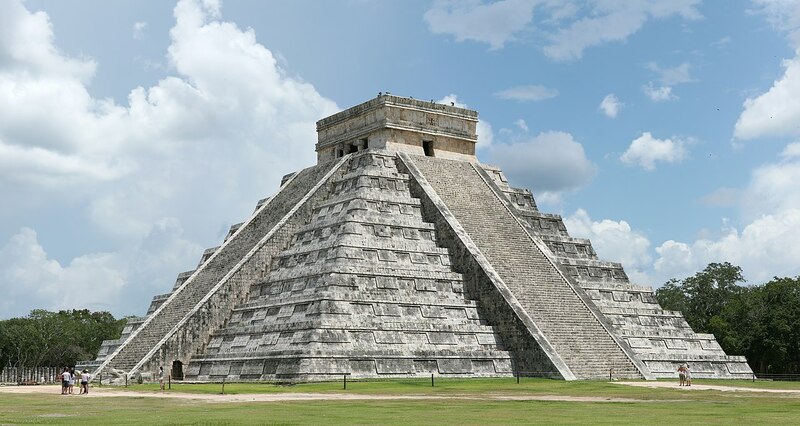 Mexican art and architecture display a combination of cultural and social themes, such as the ancient Indian civilisations. Mexican indigenous art before the invasion of Spanish people achieved a remarkable level of development and sophistication. Created by Indian with virtually no outside influence. Most Mexican indigenous art before the arrival of the Spanish was inspired by religion. The gods of the indigenous Indians dominated every facet of Indian life, and many Indian works of art were created as offerings to the gods. The Olmecs, who developed the first civilised culture in Mexico between 1300 and 400 B.C., were also the country’s finest artists. They made jewellery and ceramics but are best known for their stone carvings. Huge shapes of human heads, discovered mostly in the state of Veracruz, are the earliest portraits that remain of these ancient people. These heads are believed to have the honour of the Olmec rulers. The Olmecs pyramids began as a mound of earth covered with rough stones. The pyramids served several functions. They were temples where priests could pray and perform rituals for the gods . They were also symbolic mountains meant to bring people closer to Heaven. Elephants are featured in Mayan sculptures, although the mammoth supposedly was extinct during the time of the Mayan civilisation. One of the oldest artistic works found dates back to 30,000 B.C., done on an elephant bone. In March 1952, Mexican pre-historians Maldonado Koerdell and Lis Aveleyra found at Ixtapan a complete skeleton of an elephant with the stone artefacts, including two spearheads between the ribs of an elephant and nearby, the remnants of ‘Tepexpan Man’. the radiocarbon date was determined to be at about 10,000 B.C. , Indian myths and legends tell about an animal similar to the mammoth. In Indian life, we find tales about monsters and heroes that effectively describe an animal very similar to the mammoth. Elephants are very common in India and played an important role as the elephant gods, Ganesha, in the Hindu religion. Artefacts featuring elephants in a seated position posed as tough praying have been uncovered as stone pipes in mounds in North America, elephant bar on temples in the Yucatan, Mexico and in Copan, Honduras. This elephant bar holds a strong resemblance to the Hindu text of Ramayana, the elephant, and deeds of King Rama of Ayodhya are featured in the creation myth. Architectural stone carvings in Hindu temples of India and the extensive Mayan temple ruins of Chichen Itza in the northeastern Yucatan state of Mexico have similar stone carvings. Terms ‘Hindu’ and ‘India’ have Vedic-Harappan Legacy: Read Here!